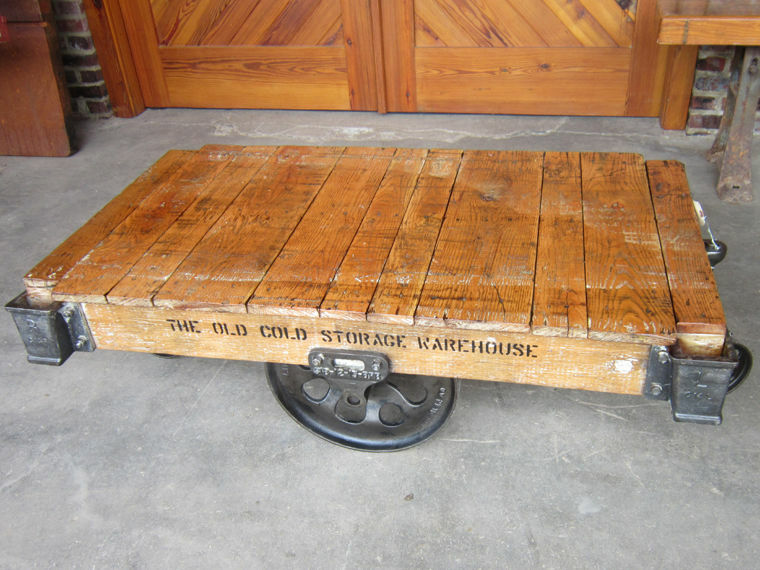 Follow our blog at http://www.oldcoldstorage.com/blog.asp to get updates as new carts are added. Or see our social media links at the end of this page. 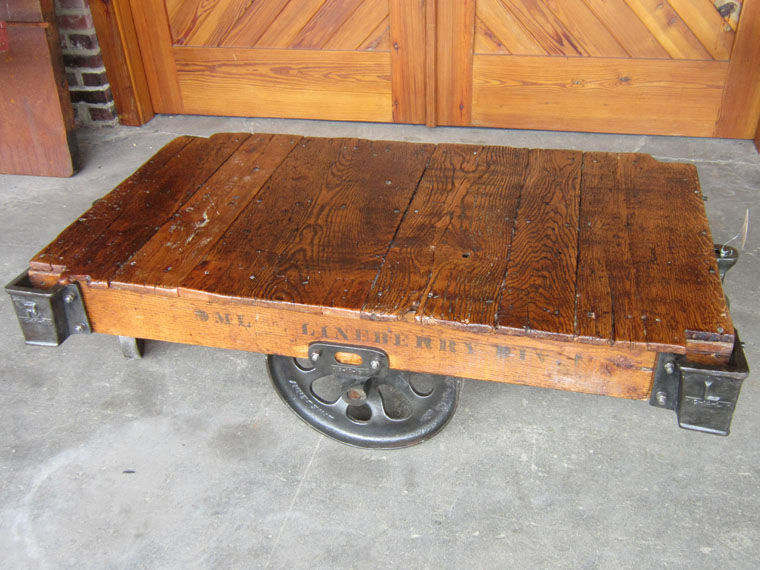 This cart has an amazing combination of features, but the original Oak tabletop is its most striking feature. The wide board shows how old this cart must be. The wood has so much character, with cracks, chips, rich grain swirls, knots, checks, and evidence of small repairs and patches. Its long history is written all over it. The original stencil is clear on both sides of the frame, and the polished cast iron hardware shows off the relief castings. 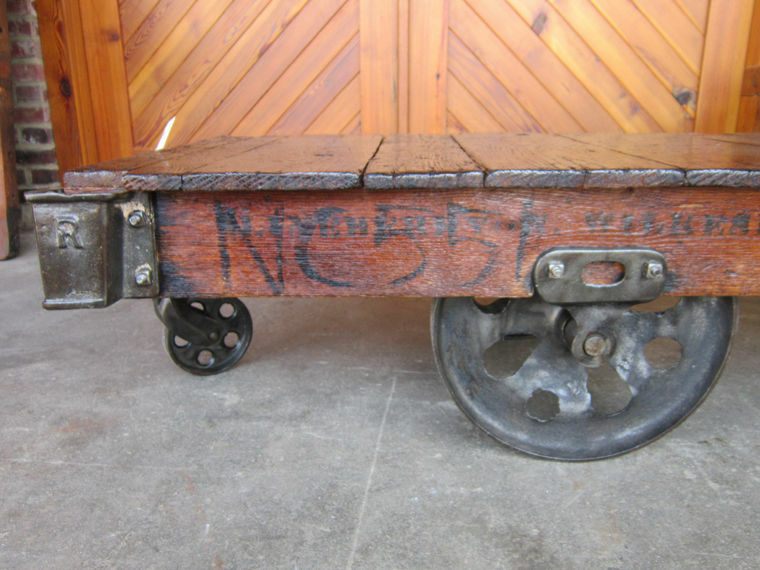 The wood top of this cart measures 27 inches wide by 48 inches long, and stands 16 inches tall. A very special cart calls for a special stencil: this is our very own brand. 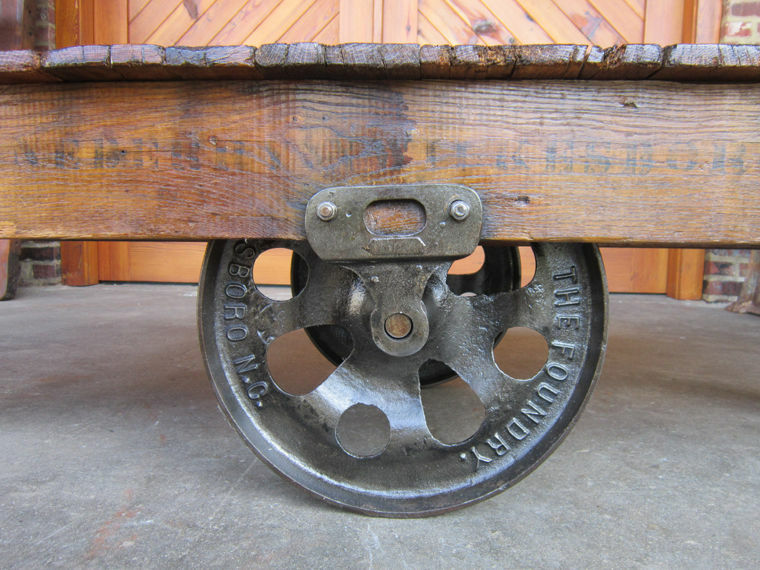 This is also the ONLY time we put a new stencil on an old cart - we never fake it, only have fun with it! This golden blond top wood deck is the original Oak in its natural color, simply sealed with a clear protectant. The original grain, knots, and color variations are enhanced by the remnants of paint from the factory embedded in the nooks and crannies of the wood, outlining whatever piece of furniture was being crafted. The rich dark color of the cast iron hardware is polished to a shine. The large part numbers stand out proud. The wood top measures 27 inches wide by 48 inches long, and stands 16 inches tall. This table has so many amazing details, I’m not sure I can fit them all in this description. The Daisy style wheels, sometimes called tulip, floral, or fleur-de-lis, are quite scarce, as are the ESP corner brackets, so named for their part number, cast in relief. These brackets project lengthwise down the cart, unlike the standard square brackets, giving the cart a lengthened appearance. The iron has darkened to a deep black over the decades from factory work, giving it an air of a long history. The dark, chocolatey chestnut color of the original top accentuates the unusually wide boards - they don’t make trees like this anymore. The faded stencil on the side is original - reading DML Inc. Lineberry Div. 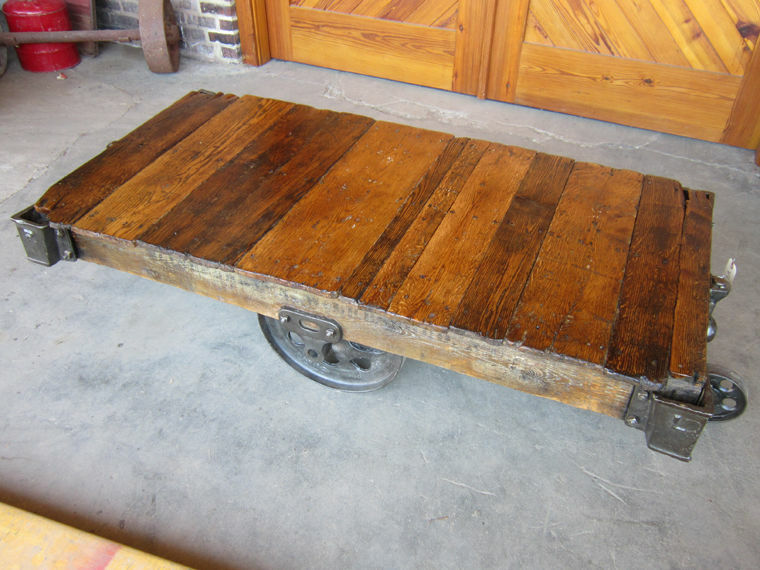 The wood top measures 27 inches wide by 48 inches long, and the cart stands 15 inches tall. The corner brackets add another 6 inches to the overall length of the cart. We are located in central Virginia, 2 1/2 hours south of Washington, D.C., and two hours west of Richmond, Virginia, and about an hour and 45 minutes from North Carolina Please contact us if you would like to make an appointment to come visit.